A rain garden is a special garden that collects the rain and filters, or cleans the water before it makes its way through the ground and sewers into our streams, rivers, lakes and eventually oceans. Rain gardens are being planted in cities that have covered the ground with roads, parking lots, and buildings. Roads, parking lots and buildings are impervious surfaces that cannot absorb water. Rainfall needs to be absorbed by permeable ground, or ground that can pass water into underground aquifers. Aquifers are the earth’s stores of underground water. Making a rain garden can help absorb rainwater. Rain gardens reduce stormwater pollutants, help prevent flooding, and improve water quality in cities that have covered the ground with non-porous roads, parking lots, and buildings. Also, rain gardens are a wildlife habitat for birds, butterflies, and insect and are as beautiful as they are useful! Next time it rains, watch to see what happens. Where does the water go? Where does it collect, where does it soak in and where does it run? Watching what happens when it rains help to locate rain gardens. Where the water collects the soil is not too permeable; where the water runs off means the surface is impervious; where the water soaks in is the location to build a rain garden. Take a picture of your house. Draw a line on the ground around your house. Using the door as a scaled reference (most doors are 7’ high) measure 10 feet away from the house and 30’ away from the downspouts. 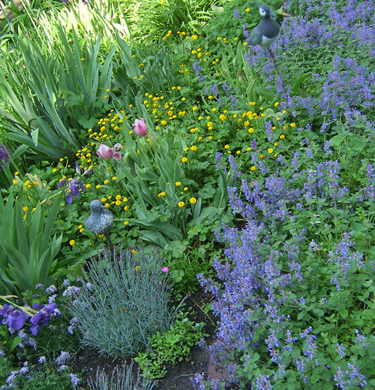 Select the area where you noticed the water absorbing, and you can begin to plan your rain garden. Find a partially sunny spot some distance from any tree roots. After calling the utility company in your city to make sure that your garden area does not contain underground utilities, it is time to test your soil. Draw a site plan diagram of your house and property and locate rain gardens! After locating where you would like to place your rain garden, it is time to test the soil. The easiest way to test the soil is to dig a hole 1 foot by 1 foot by 1 foot. Pour a bucket of water into your hole, and if the water drains at least 1" per hour, you can build a rain garden! If it drains more slowly, find a new place for your garden. Next, take a small handful of soil, add a few drops of water and roll it into a ball. Then flatten the ball. If the soil stays together and does not break into 1” or fewer pieces, the soil may have too much clay to be a good rain garden. If there is too much clay, you should dig 2-3 feet down and fill the depression with 12” of pea gravel topped with 6“ of sand and then 6” of topsoil. Measuring the width and height and depth of the layers will help you estimate how much new material you will need. Finally, smooth the top layer inward, so your rain garden will catch and hold water. Now you are off to read about rain garden plants! Once your rain garden has its new layers of permeable soil, it is time to select plants and plant them! Use the explore links or call a local gardener. Local perennial plants will grow happily in a rain garden. Dogwood shrubs, ferns, grasses, wild geraniums, day lilies, and other flowering perennials will grow with little or no maintenance after planting. Select plants for your growing season and region, availability, sunlight needs, and height, color, shape, and size. Be sure to keep them moist during the first growing season. Using Google Earth, find an aerial view of your community. Look at the rooftops, streets, roads, and parking lots. Locate the stream, river, pond or water collecting area. 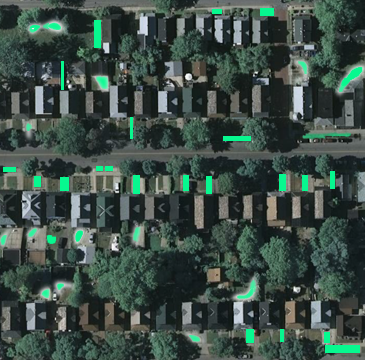 You can compute all of the non-pervious areas of your community and compare it with the permeable area that can filter water. Check to see if your community has problems with flooding or polluted waterways. 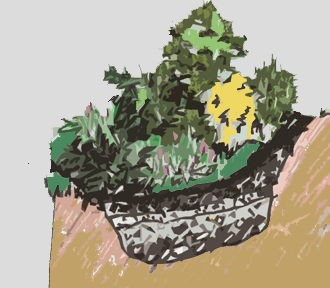 Propose areas in your community that would make good places for rain gardens. Schoolyards, parks, and street medians are good places to start. Perhaps your community will start an incentive for homeowners to plant rain gardens in their yards. Become a rain garden activist! A rain garden only catches rain. Car washing and grass watering. Rain gardens help filter storm water and improve local water quality. 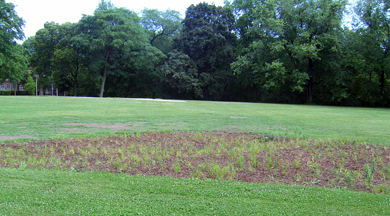 Rain gardens should be placed in the yard where the water ponds. Watch what happens when it rains. Consider the sculptural quality of the chair. Consider what is important for each design individually.